Even now when technology is at its most complex and yet most simple and most accessible, individuals and organisation still choose to use microfilming as a way of storing their data. But why is this? Microfilming is to put documents and other images on to a microfilm, much as you would have when taking pictures on an analogue camera years ago before the advent of digital cameras. But when digital cameras became the norm, analogue cameras for the most part became something of an extinct species which is the same mostly with microfilms and microfiche, but every once in a while this is still a choice when it comes to storing documents in a smaller space. 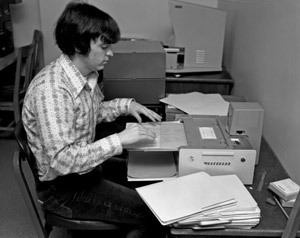 This is mainly because, though the legal admissibility of scanned documents is better than it once was, people still prefer to have hard copies of their documents and microfiche, microfilm and negatives in general are still the smallest way to store hard-copy versions of documents without taking all the room of files and paper themselves. This is of course mainly down to personal preference and is more often than not a mind-set because digital documents are now just as acceptable as physical ones but not a lot people know this. Microfilming is still a process that is done with relative ease but it has also become something of a niche service and therefore costings tend to be quite high, especially as it is ultimately a more complex process than actually converting documents to digital files such as PDFs. Converting digitally also makes them more flexible than they are on a microfilm and if microfilms are are viewed, a microfilm reader is also more often than not required and this can become quite expensive.